St. Patrick is known as a symbol of Ireland, particularly around every March. While he's obviously not Pagan at all — the title of Saint should give that away — there's often some discussion about him each year, because he's allegedly the guy who drove ancient Irish Paganism away from the Emerald Isle. But before we talk about those claims, let's talk about who the real St. Patrick actually was. The real St. Patrick was believed by historians to have been born around 370 c.e., probably in Wales or Scotland. Some accounts hold that his birth name was Maewyn, and he was probably the son of a Roman Briton named Calpurnius. As a teen, Maewyn was captured during a raid and sold to an Irish landowner as a slave. During his time in Ireland, where he worked as a shepherd, Maewyn began to have religious visions and dreams — including one in which showed him how to escape captivity. Once back in Britain, Maewyn moved on to France, where he studied in a monastery. Eventually, he returned to Ireland to "care and labour for the salvation of others," according to The Confession of St. Patrick, and changed his name. He was known alternately as the Roman Patricius, and its Irish variant, Pátraic, which means "father of the people." "Familiar with the Irish language and culture, Patrick chose to incorporate traditional ritual into his lessons of Christianity instead of attempting to eradicate native Irish beliefs. For instance, he used bonfires to celebrate Easter since the Irish were used to honoring their gods with fire. He also superimposed a sun, a powerful Irish symbol, onto the Christian cross to create what is now called a Celtic cross, so that veneration of the symbol would seem more natural to the Irish." 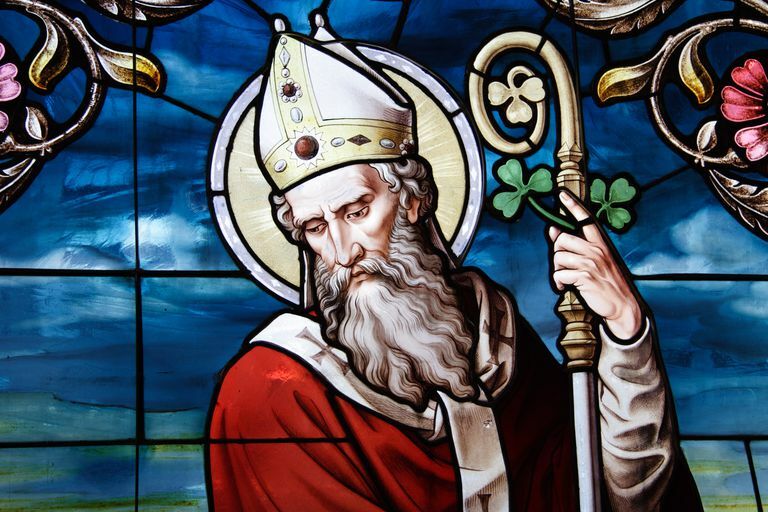 Did St. Patrick Really Drive Away Paganism? One of the reasons he's so famous is because he supposedly drove the snakes out of Ireland, and was even credited with a miracle for this. There's a popular theory that the serpent was actually a metaphor for the early Pagan faiths of Ireland. However, the idea that Patrick physically drove the Pagans from Ireland in inaccurate; what he did do was facilitate the spread of spread Christianity around the Emerald Isle. He did such a good job of it that he began the conversion of the entire country to the new religious beliefs, thus paving the way for the elimination of the old systems. Keep in mind that this was a process which took hundreds of years to complete, and lasted well beyond St. Patrick's lifetime. Over the past few years, however, many people have worked to debunk the notion of Patrick driving early Paganism out of Ireland, which you can read more about over at The Wild Hunt. Paganism was active and well in Ireland both before and after Patrick came along, according to scholar Ronald Hutton, who says in his book Blood & Mistletoe: A Pagan History of Britain, that "the importance of Druids in countering [Patrick's] missionary work was inflated in later centuries under the influence of biblical parallels, and that Patrick’s visit to Tara was given a pivotal importance that it never possessed..."
Pagan author P. Sufenas Virius Lupus says, "St. Patrick’s reputation as the one who Christianized Ireland is seriously over-rated and overstated, as there were others that came before him (and after him), and the process seemed to be well on its way at least a century before the “traditional” date given as his arrival, 432 CE." He goes on to add that Irish colonists in numerous areas around Cornwall and sub-Roman Britain had already come into encountered Christianity elsewhere, and brought bits and pieces of the religion back to their homelands. And while it's true that snakes are hard to find in Ireland, this may well be due to the fact that it's an island, and so snakes aren't exactly migrating there in packs. Today, St. Patrick's Day is celebrated in many places on March 17, typically with a parade (an oddly American invention) and lots of other festivities. In Irish cities like Dublin, Belfast, and Derry, the annual celebrations are a big deal. The first St. Patrick's Day Parade actually took place in Boston, Massachusetts, back in 1737; the city is known for its high percentage of residents who claim an Irish ancestry. However, some modern Pagans refuse to observe a day which honors the elimination of an old religion in favor of a new one. It's not uncommon to see Pagans wearing some sort of snake symbol on St. Patrick's Day, instead of those green "Kiss Me I'm Irish" badges. If you're not sure about wearing a snake on your lapel, you can always jazz up your front door with a Spring Snake Wreath instead!